Palestinians and police clashed near Lions' Gate following the noon prayer on Friday. 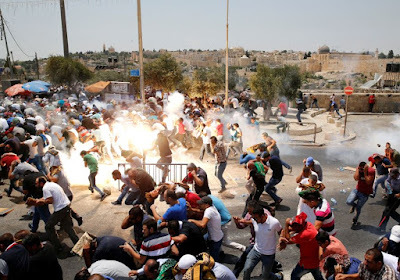 Muslim worshipers also protested and clashed with police forces in Salah a-Din street in East Jerusalem and in Ras al-Amoud. Police said that clashes started after the rioters started to throw stones at the security forces. Police used water cannons to disperse the rioters. Inside the Old City, worshipers gathered after the prayer to protest. Near the Gate of the Council (Bab al-Majlis) the rioters were dispersed by stun grenades. So far no injuries were reported. According to Palestinian reports, some 10 residents were arrested in East Jerusalem, among them were Fatah officials. People waiting to prayer told the Jerusalem Post that they oppose violence, and that eventually the Israeli government will remove the metal detectors. “We have patience,” the said. Earlier this morning the top police command held a special assessment meeting ahead of the prayer. Police chief Roni Alsheich said that the police's duty is to allow worshipers to practice their beliefs, but at the same time not to allow people to break the law. Alsheich also called on the Palestinian leadership to prevent further escalation of the situation. “I call on the Arab leadership to show responsibly and not to fan the flames,” he said.